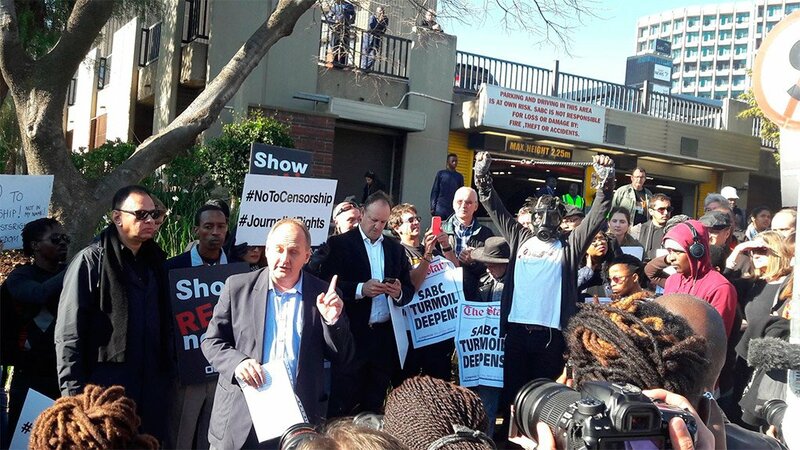 JOHANNESBURG, Friday 01 July 2016: Four South African Broadcasting Corporation (SABC)-journalists who had raised concerns over censorship and coverage rules at the public broadcaster today handed a memorandum of grievances to the Constitutional Court. 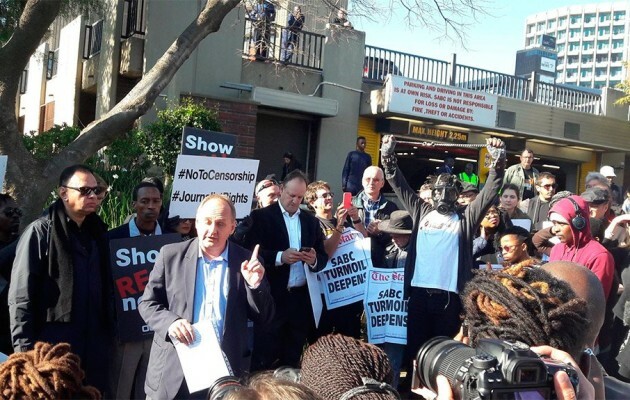 The journalists had been scheduled to attend a disciplinary hearing on Friday, but the matter was abandoned after other media-professionals and concerned organisations started protesting and demonstrating outside the SABC-offices in Auckland Park, Johannesburg. At least 70 journalists from various media houses turned up for the picket called for by the South African National Editors’ Forum (Sanef) to protest against censorship and the silencing of dissenting voices. Apart from Sanef, other organisations including the `Right2Know-campaign´, Media Monitoring and the Organisation Undoing Tax Abuse, as well as individuals, including unionist leader Zwelinzima Vavi, joined the picket before the march to the Constitutional Court. Vavi said SABC chief operating officer Hlaudi Motsoeneng was abusing his authority by introducing editorial policies that censored the work of journalists. “He tells people to turn the cameras away when they see the destruction of property‚” said Vavi. On arrival at the Constitutional Court, suspended SABC economics editor, Thandeka Gqubele, said that she was disappointed that the public broadcaster had gone in the wrong direction. “I was there in 1992 and the transition into democracy was a free independent SABC.” Gqubele said she was heartbroken and had not intended to march but felt she had to because what was happening was unlawful. On Monday, 27 June, SABC-CEO Jimi Matthews resigned, saying “what is happening at the broadcaster is wrong and I can no longer be part of it”. The hearing of a total of six journalists who were suspended by the SABC, was postponed to 11 July after they argued that they had not been given time to prepare properly. The six were suspended after questioning the editorial policies that were put in place by Motsoeneng. Motsoeneng had recently announced that the public broadcaster would not be broadcasting violent protests where infrastructure was being destroyed as he felt that the presence of television cameras only made the protestors more destructive in a bid for attention. Amongst those who were picketing was the City Press’s Ferial Haffajee, Yusuf Abramjee of Crime Stoppers International and executive editor of Independent Newspapers, Karima Brown. Political and social analyst at the Wits Centre for Ethics, Eusebius McKaiser, said that what was happening at the SABC was putting democracy at risk and sent a message to media owners that nefarious influences would not be tolerated.